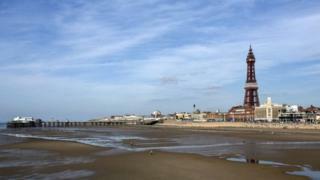 Blackpool residents are facing a 2.99% increase in their council tax bill. The council said its budget for the 12 months from April would be £124m. Savings of £9m will be made in 2019-20 - the eighth consecutive year of cuts - bringing the total reduction since 2011-12 to £153m. The council said services including health visitors, free school breakfasts and libraries would all be protected while the Conservative opposition group voiced concerns about high borrowing. Councillors approved the council tax rise at the local authority's annual budget meeting on Wednesday. Opposition leader Tony Williams warned the council was "borrowing at some of the highest levels I have seen in local government". "It is hundreds of millions of pounds," he added. "On the surface it looks like good financial management but you only need one of these loans to go pear-shaped for us to be in trouble." Council leader Simon Blackburn said "well over £800m [had been] cumulatively taken out of the council system" since 2011, the Local Democracy Reporter Service said. He said that "despite unprecedented challenges", the council's financial position was "secure, unlike many local authorities". "Our municipal transport company Blackpool Transport, one of only a handful nationally, is a fantastic success and delivering a seven-figure dividend into the council every year," he added. "We have unique public private partnerships like the one with Merlin operating our Tower and sharing the rewards." Councillors also agreed to increase the council's business loans fund from £100m to £200m. Money will also be spent on building new council houses.